Lead generation is the lifeblood of online business and most lead generation is done via email collection. If you grow a list of prospects who’re interested in your promotions, your business grows too. However, before you make money from your list you’ve got to get people on it. Whether you want people to download your lead magnet, sign up for your latest webinar or volunteer to test your product, you first need to persuade them to part with their highly guarded personal details – that’s no small feat. 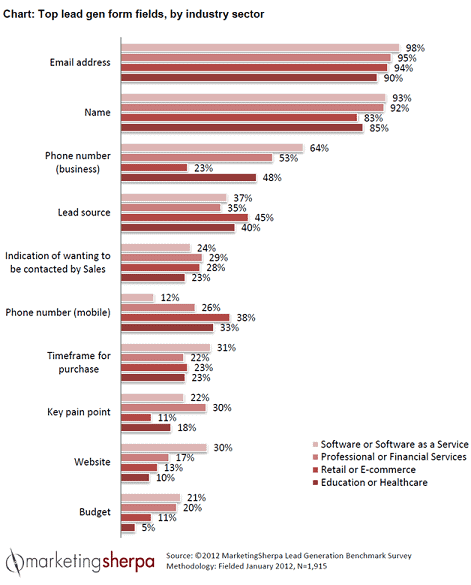 No wonder the average opt-in rate across industries is hovering around a mere 2%. After investing a fortune in Facebook advertising, PPC ads, outsourced content, content management software, site design, and more, you only net two leads per 100 visitors. Two leads… NOT customers mind you. Surely, your business deserves better. Today, we’re going to cover the eight elements of a high converting opt-in page so you can boost your opt-in conversion rates and get a better return on your content marketing investment. When your prospect arrives on your opt-in page she wants to know if she’s in the right place. If she feels lost, she’ll click away. Use the apex of your page to make her stick around. And, depending on who you ask, you have five seconds or less to do that. But how do you do it? Here’s three ways to instantly attract your reader when she lands on your page so she stays on. For example, Attention dog owners, Attention Content Marketers etc. When you name your audience you get a nod from the prospect, “Yep that’s me.” Handled correctly, this small first yes will ultimately lead to the big yes of a signup later on. For example, Free Special Report, Free Training Webinar etc. The specificity of your offer increases desire and the likelihood of the prospect staying on so as to get it. Naming the referral site on your page makes your prospect feel like a diva and warm up to you and your offer. 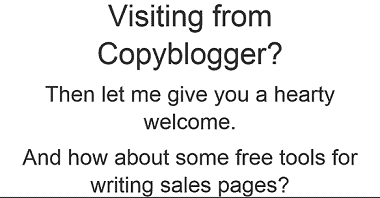 Amy Harrison rolls out a red carpet for her Copyblogger readers. She makes them feel the love by welcoming them: specifically, heartily, personally. #1. To help your prospects understand your offer…fast. #2. To alienate those who are not a good fit for your offer. #3. To attract those who are perfectly suited to your offer. #4. To build rapport with your audience in an instant. A great pre-head will keep readers on your signup page. Once your prospect hangs around, use your headline to show her how your offer will benefit her and improve her life. Promptly address her concerns so she lingers on the page or you’ll lose her by the door. Quickly address her pain, paint the desired future for her, or pique her curiosity so she can’t help herself but read on. In short, tell your prospect what’s in it for her. 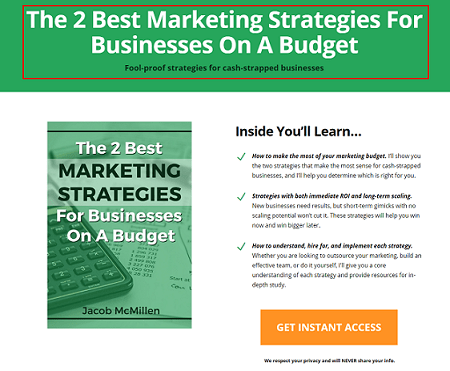 Jacob McMillen’s headline is ultra-specific and has a solution that’s tailor-made for cash-strapped businesses – that’s a big benefit that’ll keep his target audience glued to the page. Notice how his CTA, the last words in his bio, are the first words on the landing page? This way the byline is perfectly coupled to the landing page thus increasing conversions. When a reader clicks his bio and lands on the landing page she smoothly continues her conversion journey – because of harmony between the two pages, conversions are likely to be higher. On the flip side, a copy mismatch between the source page and the signup page tanks conversions. You’ve done well if your prospect is still on your page thus far. Your next few lines should give specific points about your offer. Show her how your offer will scratch her itch or push her towards her dream. Do that and she’s more likely to give you her details. Clear- use simple direct language so the prospect easily grasps your offer. Crisp- keep your points brief and to the point to keep the prospect engaged. Catchy- use attention-getting words to give details about your offer. 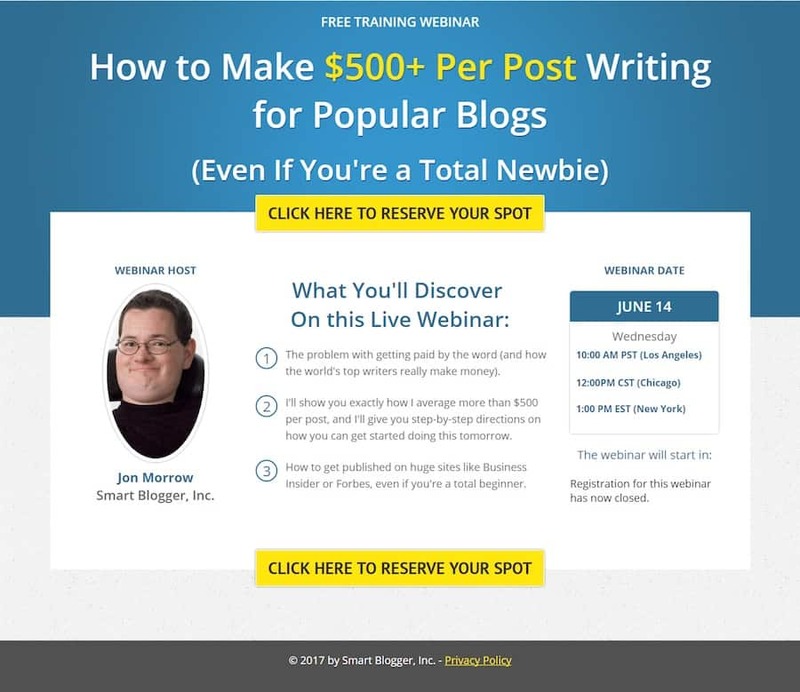 Smartblogger nails their bullet copy on this sign-up page for an upcoming webinar. The three bullets tell you exactly what you’ll get on the webinar in a simple engaging way without laboring the point. If you’re going for the minimalist approach even a single line will do. The amount of copy on the body of your opt-in page depends on three key factors. #1. How aware is your prospect about you and your offer? The more aware she is about you and what you do the less copy you need and vice versa. #2. What works best for your niche? Study the most successful signup pages in your niche and do likewise. #3. How complex is the problem you’re trying to solve for the prospect? The more complex the problem, the more copy required to convince prospects to sign up. Our brains process images up to 60,000 times faster than text. To woo your prospect so she says yes to your proposal (offer), show her what she’ll get. Use a picture of the product or of people expressing the feeling you’re targeting. Pictures of animals work well too if your context allows it. 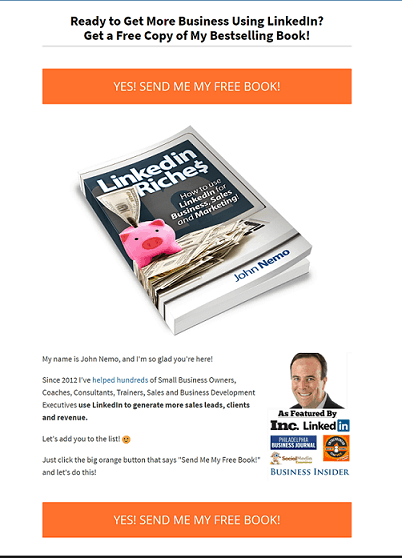 John Nemo’s book shot dominates his opt-in page on purpose. You can almost smell the LinkedIn cash splashed on the cover ☺. A word of warning about pics: don’t just include a picture because you like it…that won’t help your cause. Only include a picture if it’s relevant to your offer. You’re almost there now… your prospects cursor is hovering over the signup field. Now comes the big question…how much info do you want from her? Numerous tests show that, in most cases, the fewer the signup fields, the higher the conversion rates. That’s why most sites simply ask for an email address and/or name only as shown in the Marketing Sherpa lead generation graphic below. Of course, you can ask for more than that if you want a more targeted list. Although your conversions may dip, the quality of your list will improve. Ask for what you need and no more. This makes filling the fields more desirable. You can always ask for more details later. But, as with everything digital, conduct split tests to see what works for you and your audience instead of blindingly jumping on the bandwagon. 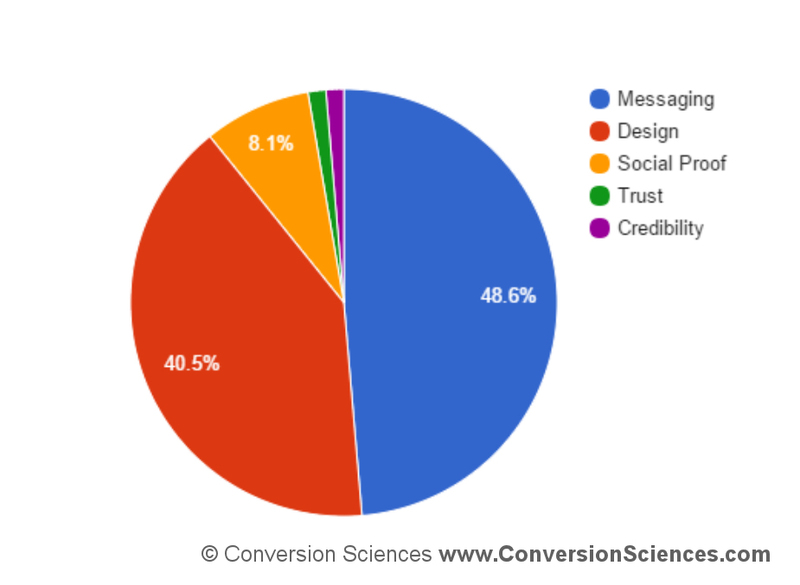 In many cases, tests have shown that increasing the number of fields actually raised conversions. To nudge people over the sign-up line, you can use big numbers associated with your following. However, be careful as numbers can be a double-edged sword. If your numbers are small, social proof will still work, but against you! No-one wants to be a part of something small and insignificant. Social Media Examiner uses their massive list to good effect to inspire people to join their list. 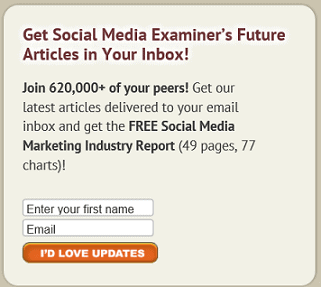 Surely, on seeing the 620 000+ social media marketing peers on Social Media Examiner’s list, a prospect will be enticed to sign up. Testimonials multiply your clout score thus making it easy for people to take up your offer. Henneke Duistermaat, of Enchanting Marketing, does a neat job. Not only does she head the page with a rich list of big sites she’s been featured on, she sandwiches her offer between two testimonials from heavyweights in her niche. Prospects are more likely to trust her word and gobble up her course. To get prospects to sign-up for a free trial, Get Response leads with an imposing figure of their current users and then they underline their authority in their space by quoting two influencers. This is likely to cause more people to take their software for a spin. Because cyber-crime is rampant, your prospect is uneasy. Hardly a day goes by without someone being scammed or spammed online. Allay her fears…wrap your arm around her and let her know you’re not one of the bad guys. Tell her you won’t peddle her email address nor send the alien stuff she didn’t ask for. A brief statement such as ‘We respect your privacy and will never share your info’ is enough as Neil Patel does. Basically, your privacy statement should assure your visitors that their info is safe. Only when they feel you’re trustworthy will they be swayed to give you their personal information. Your call to action marks the finishing line of the sign-up race. Give it some thought. Your button copy should be specific, simple and reader-focused. Tell the prospect exactly what she’ll get if she signs up. Don’t try to be cute, clever, or cryptic, or you’ll lose out. 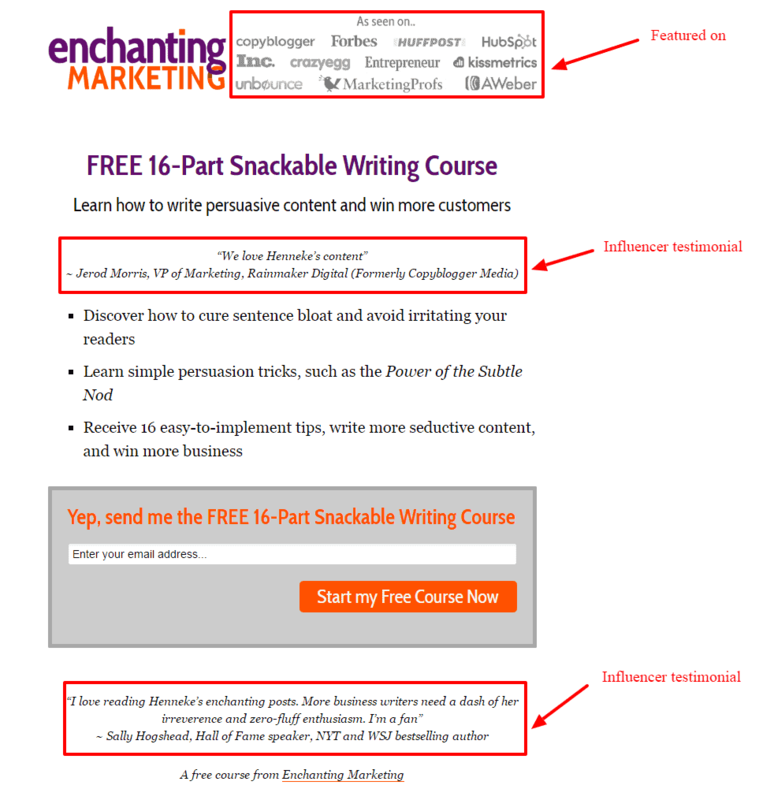 And please, don’t make the rookie mistake made by many content marketers – using the dismal default CTA copy e.g. signup, subscribe, or download. Don’t leave your visitors wondering what they are clicking the button for. A simple formula, coined by Joanna Wiebe, will help you ace your button copy. Just fill in the blank: I want my reader to __________________. Book a free call…becomes…Book my free call. Get a free quote…becomes…Get my free quote. 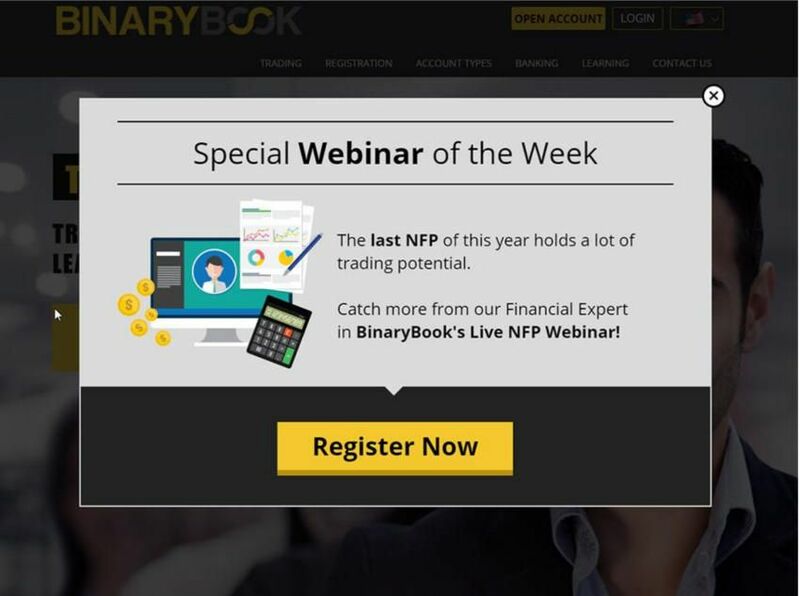 Reserve a spot on webinar…becomes…Reserve my webinar spot. The CTA is clear, simple, direct, benefit-focused, and urgent – all the hallmarks of a powerful call to action that converts. Make the desired action simple and easy smoothly guiding the prospect towards your goal without much work or resistance. Use energetic verbs and the first or second person to make the CTA personal and bump up your conversions. 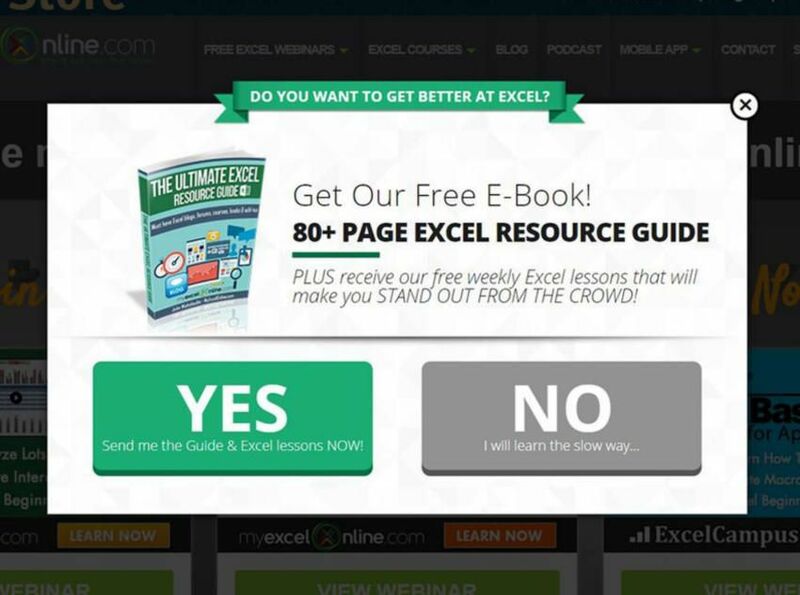 Once your reader clicks on your button, you’ve won and now have a precious lead in your funnel. Opt-in pages are crucial to the overall success of your business that you should seriously consider outsourcing the task if you don’t have the time or the expertise to craft them yourself. Getting signups is an essential bridge in your inbound digital marketing efforts. It’s the magic link that turns browsers into subscribers, subscribers into buyers, and buyers into brand evangelists. In short, it’s the gateway into your funnel. As a serious growth-focused business owner, take time to work all these elements into your page so you increase the likelihood of success. Then you’ll hear the sound of clicks not crickets for a change. Phone lead generation is still a highly effective way to reach prospects. Give these 8 advanced tactics for increasing your B2B telephone leads, sales and outbound ROI a try. Telephone sales aren’t what they used to be. It took only 3.68 cold call attempts to reach a prospect in 2007. Today, it takes around 8 attempts, more than doubling the difficulty of landing sales over the phone. But as you know, phone sales certainly aren’t dead. They just require a higher level of strategy and mastery. A study by Baylor University found that it takes roughly 7.5 hours to secure one referral or appointment through cold calling methods. If you only have one dedicated phone salesperson, your company could have one new appointment or referral every day via cold calling. For most B2B businesses, where phone selling strategies are most commonly found, one lead per day per salesperson represents a very strong ROI. Today, we’re going to help you sell over the phone like a modern pro. In sales, as in many areas of life, timing is everything. You will often accomplish more during peak hours than you do the rest of the day. So even if you are in a position that requires around-the-clock calls, it’s important to be at peak efficiency during those peak hours. So when are those peak hours? The best time period to contact leads is between 4:00-6:00 p.m. The best second best time period is between 8:00-10:00 a.m. The worst time period to call is between 11:00 a.m.-2:00 p.m. The best days to call are Thursday and Wednesday. The worst days to call are Tuesday and Monday. It’s worth checking out the study, because these aren’t insignificant differences. For example, calling on Thursday versus Tuesday increases results by an average of 50%. Calling at 4:30 p.m. versus 11:30 a.m. increases results by an average of 114%! Timing might seem cliche, but what other tactics do you know of that can immediately double sales? I’m going to borrow and re-spin an example from Jason Quey. Sid works at a large SaaS company. When it comes to larger tool purchases, he makes the decisions. However, Sid rarely creates content for the team. Tyler is in charge of content. If your sales team is attempting to pitch a solution to the content problems Tyler is facing, appealing to Sid around those challenges won’t be effective. The best way to pitch Sid is very different from the optimal way to pitch Tyler. The Gartner Group reports that in a company of 100-700 people, an average of 7 people are involved in buying decisions. If you aren’t tailoring your pitch around these people, you will struggle to succeed in B2B phone sales. There’s no getting around that. For help identifying and reaching decision makers, check out this guide from Lead Forensics. We know that cold calls can work, but there’s a way to make them work better. UNC professor Dave Roberts said it best, “Cold calling is old fashioned… Aim for hot calling.” The more prepared you are when you call, the better that call will generally go. We live in an age of the internet and social media. Before you call a prospect, Google them. Learn everything that you can before ever making the call. This can help you know what the customer’s needs are, what their objections might be, and what interests them. You may happen upon what their biggest pain is right now. There are many ways to make a superficial connection with someone that quickly turns you into a known entity versus a cold call. For more tips on laying the groundwork, check out this article by Owen Matson, Ph.D. There are no downsides to using a sales script… only to using one poorly. They force you to create and refine a consistent sales methodology. They allow you to provide a baseline for your entire sales team’s performance. They allow sales reps to spend less time thinking about what they’re going to say and more time listening to the potential customer. They provide talented sales reps with a strategic baseline off of which they can improvise. To learn how to create your own sales script, check out this guide from Close.io. Navigating objections is a central part of any sales process, but there can be a bit of a misunderstanding about this issue. Some objections always need to be covered and getting out in front of them can be beneficial. For example, if your product is twice as expensive as every other competitor, it’s almost guaranteed that issue is going to come up, and addressing it before the customer does gives you the chance to frame it in a positive light. Not all objections are created equal, however, and sometimes, bringing up certain objections simply bogs down the sales process and creates doubts that weren’t there to begin with. Instead, have a plan to overcome these objections IF they are brought up. For more on covering objections, here’s another top notch guide from Close.io. 6. Stop Talking. Ask and Listen. The more your prospect is talking, the better your chance of closing the sale. Outbound sales and inbound sales follow up are an inherently aggressive activity. You are on the offensive. You are seeking out people to sell them something. But often, the solution is simply to slow down and get out of your own way. The best sales scripts and salespeople are focused on asking the right questions. The prospect doesn’t need you to create challenges for them. They have numerous pitfalls and problems on the path to their goals. Your job is to create a situation where the prospect is articulating those challenges… not you. Ultimately, B2B sales isn’t about tricking people into getting a product or service that doesn’t work for them. It’s about matching beneficial solutions to the businesses that need them, and that requires a two-way conversation. Your goal as a salesperson is never to sell someone on a price. Your goal is to sell them on value – such incredible value that the price seems like a no-brainer. It’s very, very important that you focus on this value BEFORE discussing pricing, for a number of key reasons. First, if pricing is brought up first, your product/service will be evaluated as a commodity. Once a number has been mentioned, everything will be filtered through that number. You will have zero leverage in presenting your value. Second, if you don’t pitch you value before getting to pricing, the prospect will consider the pricing based on their preconceived assumptions about the value of your product class. And remember, they aren’t currently using your product, so it’s likely they don’t consider the value to be worth the cost. Finally, if you don’t understand the prospect’s needs before you get to pricing, you might propose a price that is too low or too high. Too high, and the conversation is essentially over. Too low, and you won’t be considered a serious player. Without getting to know the prospect first, you are playing a dangerous guessing game. You already probably know your “hook, line, and sinker.” You have your closing speech down to a science. That’s great, but just know that you will talk to a person several times before they’re ready to hear your golden pitch. According to Marketing Donut, 80% of sales require 5 (yes, FIVE) follow up calls. 44% of salespeople quit after just 1 follow up. Don’t be a quitter! Telephone sales are more challenging than ever, but they are worth the trouble. Use these 8 advanced tactics to improve your B2B sales calls and close more sales. Do you need help increasing the number of inbound leads? Would you like your phones to ring more often? Find out how Conversion Sciences can help with results-driven lead generation solutions. Contributor: Rachel Africh is the CMO of TheLeadsWarehouse.com and is an expert on marketing tactics and generating targeted leads that convert for sales industry professionals. Searching for taglines for business growth? Take a look at these 9 business tagline examples that drove multi-million dollar growth. Understand when taglines and slogans are important and how to write a winner. Taglines and slogans can get a bit of a bad rap in the conversion world. When the goal is immediate conversion, a targeted, well-written value proposition will beat a vague tagline every day of the week. But that doesn’t mean taglines aren’t important. In fact, depending on your company size and marketing strategy, a tagline can have an even greater impact on your total revenue than your highest converting value proposition. The key is to understand when taglines are important, why they are effective, and how to write a winner. Today, we’re going to cover all that plus look at 9 tagline examples that helped drive multi-million dollar growth. Just so we’re on the same page, a tagline is a catchphrase or slogan used to advertise a brand. It’s a short phrase or series of phrases, often presented in conjunction with the brand logo, that is intended to add meaning to the brand. So, when is it important? The simplest way to put this is that if branding is very important for you business, your tagline will also be very important. Now, you might say, “Branding is important for every business,” and while you wouldn’t be wrong, the spectrum from “important” to “very important” is actually quite large. Business #1 sells clay coasters on Amazon. 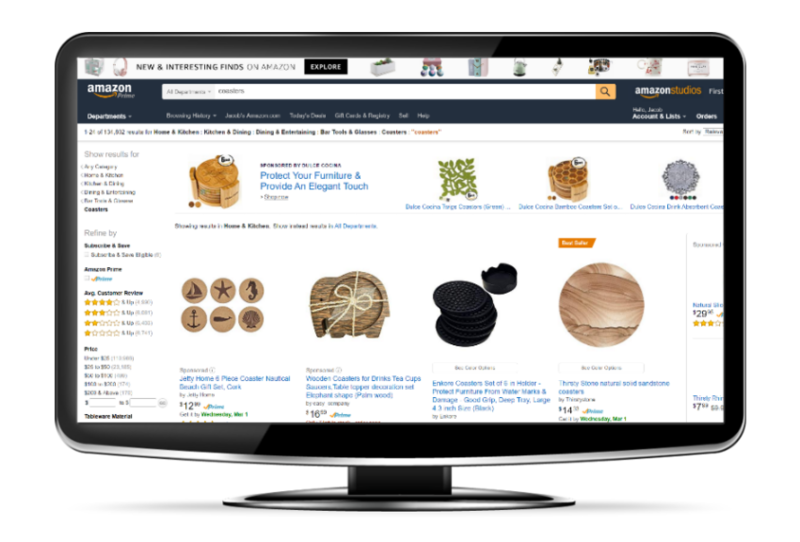 Their #1 marketing goal is to get their Amazon listings to show up at the top of both Amazon and Google’s algorithms for that product category, and they spend 90% of their marketing budget on PPC. Branding really isn’t that important for Business #1. Not everyone needs to invest in a compelling tagline. Business #2 sells luxury cars. 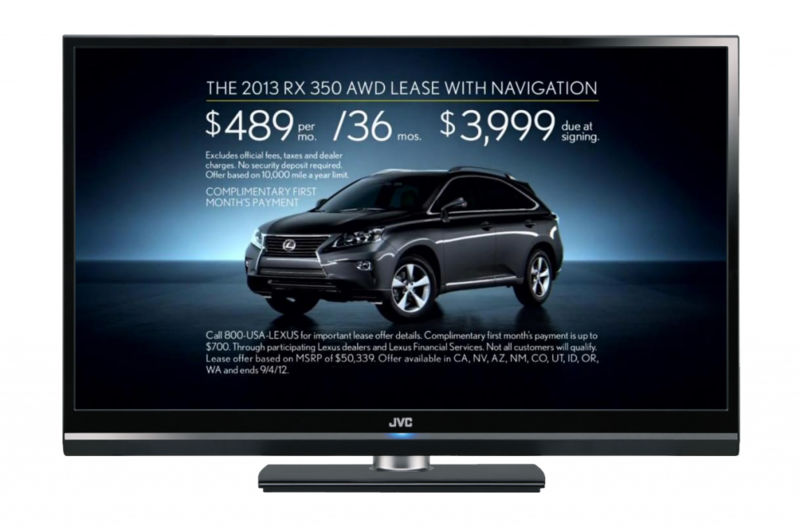 Their #1 marketing goal is to be top of mind year-round for consumers making between $85k – $300k per year, and they spend 75% of their marketing budget on television ads. Branding is VERY important for Business #2. Taglines can really help if you need to stay in your prospects’ minds. These two examples demonstrate both ends of the branding spectrum, with most businesses falling somewhere in between. For the purposes of this article, we’ll just say that you will typically want to use a value proposition when you are looking for a direct response and a tagline when you are looking to make a brand impression that leads to a sale down the road. That said, a good tagline will often demonstrate similar traits to a good value proposition. The two aren’t mutually exclusive. They just have different purposes. A value proposition’s goal is to explicitly describe why the product is the best available option for the consumer and should be purchased immediately. A tagline’s goal is to attach significant, lasting meaning to the brand in a way that resonates with the consumer. So how do we create a compelling tagline? Your tagline is your chance to immortalize your company’s purpose in a brief phrase or series of phrases. It first and foremost needs to reflect your mission. Your tagline is also a prime opportunity to reflect your brand’s persona or personality. It’s important that your tagline communicates an idea about not just what you do but who you are as a brand. Finally, the goal of your tagline is to resonate with your target audience and connect your brand to a powerful set of positive emotions and ideas. In order to best demonstrate these qualities in action, let’s take a look at several exceptional tagline examples that helped their companies create multi-million dollar brands. Co-Founders Elizabeth Cutler and Julie Rice wanted to create an exercise experience that was fun, exciting, and felt like a community. Noticing a void in the market, they opened the first SoulCycle in a former New York funeral home in 2006. Since their scrappy beginnings of handing out fliers for free classes (it was against building regulations to put up any signage), they’ve expanded to 85 locations and continue to expand to new locations in 2017. Soul Cycle’s tagline focuses very much on their target customers – fitness enthusiasts who see exercise as something physical, mental, and spiritual. The statement exudes a sense of excitement and empowerment for riders, and implies that something metaphysical can come out of an intense 45 minute stationary bike session. 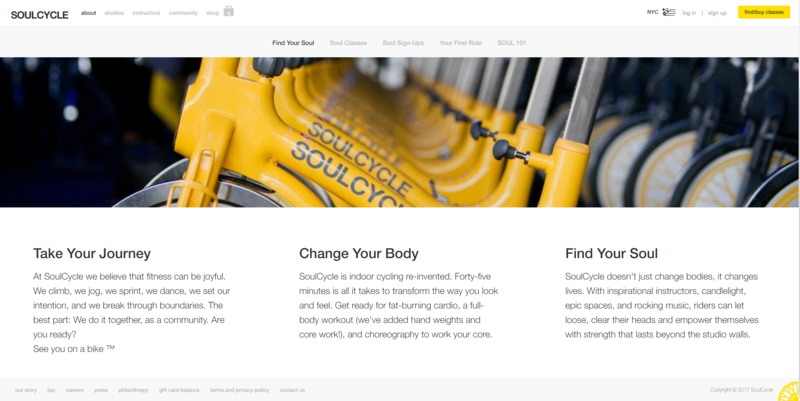 The tagline is sometimes shortened to simply “Find Your Soul”, which emphasizes the brand’s mission of connected, community-based workouts. The key idea here is that SoulCycle plays into the innate human desire of being part of a community. It’s exceptionally smart, because how we relate to others and the world around us affects our buying decisions. This explains Soul Cycle’s customer loyalty, which has skyrocketed the business’ profits. This tagline isn’t just a tagline either. It is reflected in everything the brand does. Cyclists ride by candlelight in ‘epic spaces’ where they feel like they’re part of a ‘tribe’, and instructors constantly howl motivational phrases and speeches at the riders. Even with a costly fee of $35+ per session and minimal discounts for monthly memberships, SoulCycle has still found its niche in the world of standard gym equipment. The business amassed a rider base of nearly half a million people by catering to their specific customers. For example, they play different music for the 5pm university crowd compared to their 6am pre-work crowd. Their explosive growth is partially fueled from upsold products, including branded swag, bottled water, and shoe rentals, adding another $85 million in revenue on top of monthly fees. Each franchise earns an average of $4 million per year. Their total revenue grew from $36M in 2012 to $112M in 2014. TOMS shoes started when founder Blake Mycoskie went to Argentina in 2006 and saw children running around without shoes. He also took note of the Argentinian traditional shoe, the soft alpargata that TOMS shoes are modeled after. He came back to America with a vision of the “buy one, donate one” and had 250 samples made. He approached American Rag to sell the shoes, and the LA Times picked up the story. The story created a demand for nearly 10 times as many shoes as what was in stock. TOMS shoe company was officially born. Tagline examples: Tom’s pioneered the One for One business model and the tag line says it all. TOMS tagline is incredibly powerful because of the message it communicates. Buy one pair of shoes, and one additional pair of shoes is donated to a child in need. Not only is this a brilliant business model, as 62% of modern consumers are willing to pay more for socially or environmentally conscious goods, allowing TOMS to sell $4 worth of shoes for $40, but it also directly counters the often vague language and spending that accompanies most charities. The consumer knows exactly what is happening. The get a pair of shoes they want, and a child in Africa gets a pair of shoes they need. This tagline hits on all the right notes. It communicates the mission and resonates with the target audience. You could even argue that it communicates a straightforward personality. Not only that, but 86% of those customers tell their friends and family, giving socially conscious businesses like TOMS plenty of free advertising. The phrase is also crystal clear: it describes the company’s business model in 3 words. The company has donated over 60 million pairs of shoes. As of 2016, they have made over $625m in revenue. The company is now as widely known as Nike and Adidas. They have expanded the one-for-one model to other products. For every pair of sunglasses they sell, TOMS provides a full eye exam and prescription glasses to those in need. For every purse TOMS sells, the company provides medical materials to help with safe childbirth. 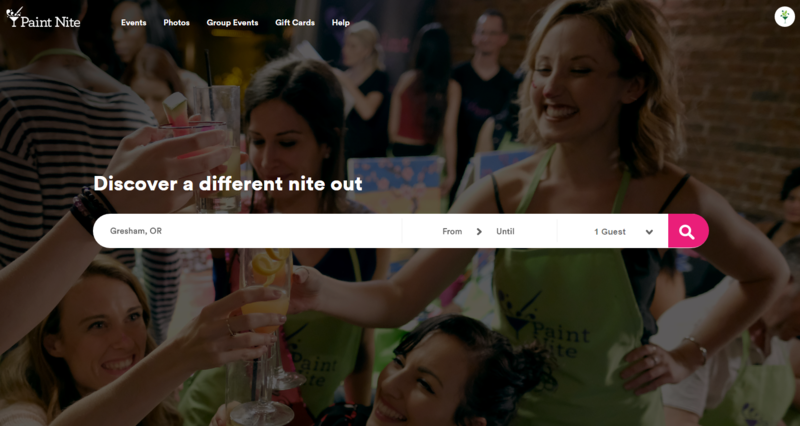 Tagline examples: Paint Nite is not a painting class, it’s a different nite out. Paint Nite’s tagline is deceptively powerful. It’s communicating something very specific to it’s customer base comprised of 90% women. By offering a “different nite out”, they’ve attracted a crowd that still want to get out, socialize, and have some libations but outside the usual scene of bars or clubs. This is a brilliant strategy as the bar and club scenes have experienced declining popularity with millennials. One study found that those under 35 felt that the traditional night out is too impersonal and too exhausting. Paint Nite met this need by creating a fun group environment where participants have common ground to talk to one another. Sitting and painting while sipping wine requires a lot less energy than drinking and dancing until closing time, and this “differentness” is reflected beautifully in their slogan. It’s revenue has grown by more than 36,555% in three years. Is now available in 155 cities world-wide. Canada Goose began nearly 60 years ago and became popular in the 1980’s when their red down-filled coat (aka Big Red) was developed for scientists at Antarctica’s McMurdo Station. Its popularity increased further in Europe due to its decision to keep manufacturing in Canada, and Americans took to the brand when celebrities like David Beckham and Kate Upton were spotted sporting their signature coats. 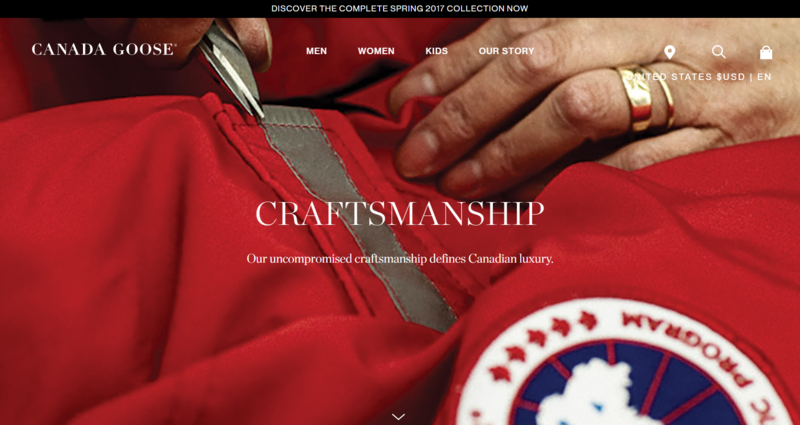 Even when it was vogue to move manufacturing overseas for cost reduction, CEO Dani Reiss knew that keeping the manufacturing in Canada was a huge selling point for customers, so Canada Goose reaffirmed its value proposition around that selling point. The above tagline is more of value proposition mixed with a tagline, and a simpler version with only “Canadian Craftsmanship” can be found on the site as well. This tagline is a great example of matching mission to customer in as little as two words. “Canadian Craftsmanship” speaks volumes about both the products being produced as well as the consumers who purchase them. This focus on quality craftsmanship is further enforced by the brand’s lifetime guarantee on it’s signature products. Canada Goose coats are not only known for their high quality but also for being some of the warmest on the market. Because of their commitment to quality, expressed beautifully in their tagline, they achieved incredible success. Expanded brand recognition when movie crew members were spotted wearing the coats while shooting in cold locations. Featured on the cover of Sports Illustrated’s Swimsuit edition, modeled by Kate Upton. Grew their revenues from $3 million in 2001, to $200 million in 2014. GoPro is the brainchild of Nick Woodman who noticed that the only way to capture a surfer’s tricks was from land or on a jetski. He bootstrapped the company by selling belts decorated with beads and shells out of his van, and the prototype was born. GoPro actually has two primary landing taglines. Both of these taglines do a great job of representing the brand, albeit in different ways. Tagline examples: GoPro, Be a HERO. GoPro was invented for the purpose of capturing extreme sports like skydiving or snowboarding, and their taglines encapsulate that, inviting users to “be a hero” and take extreme action, capture their exploits on film, and then share their adventures with the world. These taglines are very customer focused, which fits with GoPro’s marketing strategy. GoPro’s marketing revolves around user generated content, and their taglines help to invite new users to participate in sharing their GoPro captured activities with their friends. GoPro made $150,000 in revenue from the Home Shopping Network in its first year of official sales in 2004. As of 2016, GoPro has grown to be a $2.5 billion enterprise. 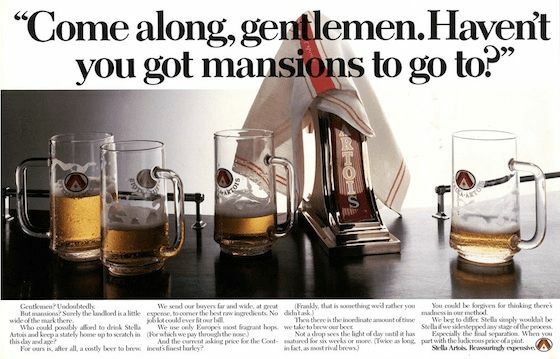 Stella Artois has a nearly 700 year history, so their taglines have evolved over the better part of a millennium. Stella has been around since 1336 and was originally brewed as a pricey, limited edition treat for Christmas. That was until 1981 when they turned their price point into a positive with a “Reassuringly Expensive” tagline. The statement worked and Stella Artois successfully flipped the narrative from “too expensive” to “classy”. Stella Artois turned high price into a selling point. That was until football fans realized that Stella contained a higher percentage of alcohol than other beers and began drinking it to get drunk. It caused a rift between the company’s brand and public perception as fans were pictured rioting with a Stella in hand. To turn their image around, they repositioned themselves in 2008 with a new tagline: “A thing of beauty”. The marketing campaign displayed their ‘9 Step Preparation Guide’ that implied the consumer needed skill and a certain amount of grace to pour the perfect pint of Stella. Last year saw another revamp in their marketing, as the company sought to make its beer appear not only more classy, but more personal. 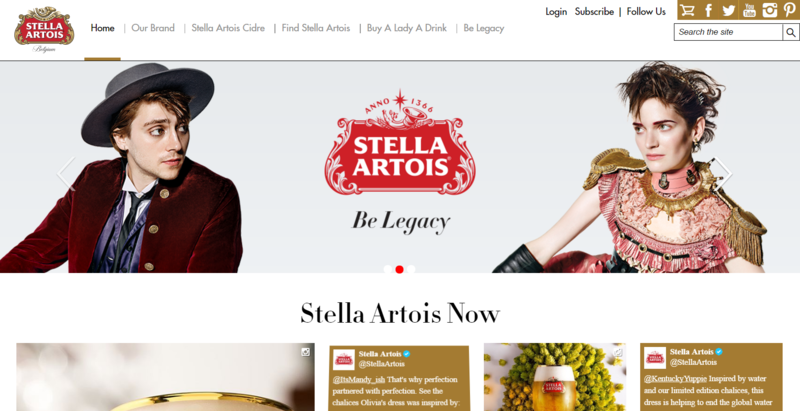 Stella’s new tagline shows off their brand personality by reaching back into their history to the beginnings of Sebastian Artois, a man who sold all of his belongings to buy the brewery down the street. They also preface their tagline with the phrase, “what will you be remembered for?”. It does a great job of targeting an emotion behind their beer that isn’t partying on a boat. You drink their beer to live life. Stella is the best selling beer brand from Belgium and is sold in over 100 countries worldwide. The beer has is also widely recognized as being “sophisticated” by consumers, and “the best premium lager” in 2013 by the Morning Advertiser. 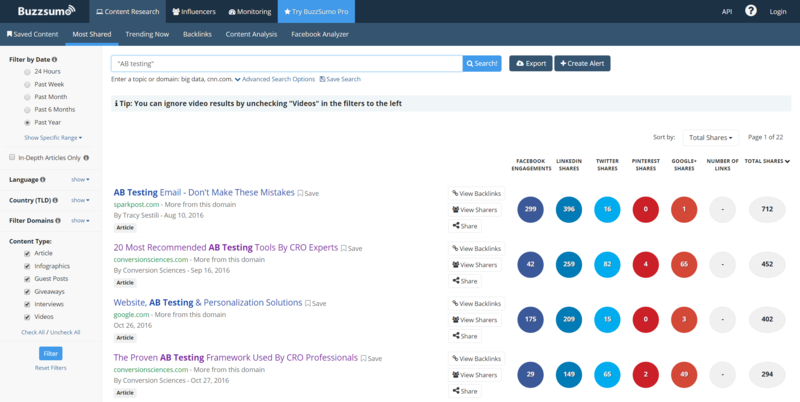 BuzzSumo allows people to find the most popular content around a given keyphrase. Instead of manually searching websites for your keyword, Buzzsumo amalgamates the most popular content for that keyword, how many social shares it received, and who shared it. Tagline examples: Buzzsumo’s tagline is found in its user interface. This tagline doubles as a value proposition. It’s a no fluff explanation of the real value being provided by the brand. Do you want to find the most shared content? Are you looking for key influencers? Well, then you’re in the right place. They received 160,000 “freemium” subscribers and 2,000 paid subscribers in their first year. After 1 year of operations, Buzz Sumo generated $2.5 million in revenue. Used and promoted by Neil Patel, Matthew Barby, and Mari Smith. 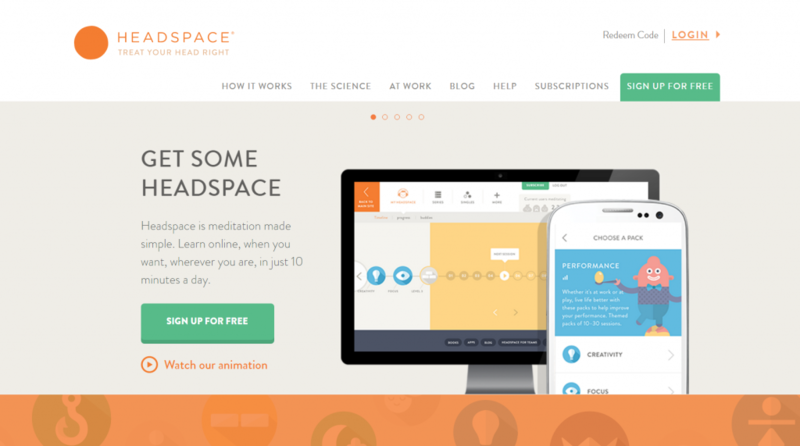 Headspace began with a meeting between two men. Andy Puddicombe, an Englishman, became a monk after having the traumatic experience of losing two friends and a step-sister. He wanted to bring the technique of mindfulness to the masses, and created a meditation app called “Jeeves”. At the same time, Richard Pierson, another Englishman, was burned out from his job. To help calm his anxiety, a friend of his had recommended Jeeves. Inspired by the app, he approached Puddicombe with a proposition – he’d market the meditation app in return for one-on-one meditation lessons. The men tapped into the 1.2 trillion dollar mindfulness industry in 2010, when they brought meditation to where most people were spending their time – their phones. Traditionally, the general public in North America has viewed meditation as something exclusive to monks, hippies, or other niche groups. Headspace has helped change this perception withe their broad outreach. Through their approachable brand personality, exemplified through their tagline, they showed that meditation isn’t some ethereal experience meant only for “mystics”, but rather, something anyone can do to “treat their head right” as part of an everyday mental health routine. It received $30 million via a Series A in 2015. The subscription based model of pricing has resulted in the app reaching a net worth of $250 million. Headspace has been adopted by celebrities like Richard Branson, Jessica Alba, and Lebron James, fueling its growth. It is ranked as the highest quality “mindfulness-based” app according to the peer-reviewed Journal of Medical Internet Research. 9. Dollar Shave Club: Shave Time. Shave Money. Dollar Shave Club was born out of a party conversation between Mark Levine and Michael Dubin, where they shared their frustrations on the high cost of razor blades. They came up with the idea to send blades via a monthly subscription box for $1 (with $2 shipping). The pair launched Dollar Shave Club’s website in 2011. 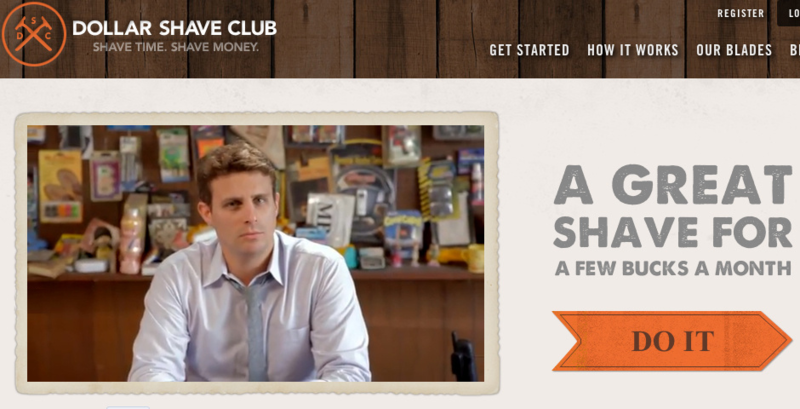 Dollar Shave Club showcases brand personality incredibly well in their tagline, website, and across all of their marketing campaigns, branding their company as a club for common sense, sarcastic smart alecks… you know… what every guy aspires to be. Up until Dollar Shave Club’s existence, many had griped about the absurd cost of disposable razor blades, but very little had been done about it. Dollar Shave Club cashed in on the strategic idea of delivering blades bought in bulk but repackaged for individual use, capturing the sentiment that we all need to save time and money, even in the smallest of ways.
. The add also attracted $1 million in investment in the company. The following year, the company raised $9.8 million to expand internationally into Canada and Australia. Create a tagline that reflects these qualities, and you’ll have secured a key piece in your branding campaign. If you ever went to the government and asked them what your fair share of taxes should be, they would first ask you how much you made last year. And that would likely be the answer. Nonetheless, I’m going to give you the tools to add conversion optimization to your budget next year. Then, when you call us next year, you’ll be ready. 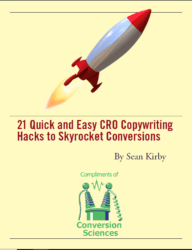 One key question you need to ask is, where will I get my CRO budget? I have some suggestions. The basis of any conversion optimization effort is a sound analytics and measurement foundation. This consists of tools that slide under your website and are bolted in place. This is IT stuff. Our research has shown that most businesses’ websites have some level of implementation of analytics. You don’t want to be left behind. This is a crucial behavioral database that will be invaluable as you begin to vet ideas for testing. It is a golden age of marketing. We have more tools, data sources and shiny objects to drive our online businesses than any marketers have ever had. We can mobile gamify our ratings and review process using direct visitor feedback to drive personalization throughout our content funnels. In other words, we’re overwhelmed, and the first sign of a marketing department that is overwhelmed is the decision to redesign. [pullquote]Your website probably doesn’t need a redesign. It probably needs to be optimized. [/pullquote] Put the redesign money into an optimization program and see immediate results. There is a good way to get your head around all of the things you could be doing to your site. You could test the ideas. Instead of blindly pouring money into exit-intent popovers, live chat, or personalized recommendations, you should test them. We have seen these work and we have seen them fail. Your conversion optimization team will know how to use data to make good decisions on where to spend your money. Budget for optimization first. Paid search is a great way to generate qualified traffic. However, our success in search causes our fundamentals to “regress”. It becomes harder to increase traffic, and the new traffic often is less qualified, less profitable. When you spend more, get less traffic and make less money, it’s time to try optimization. [pullquote]When your traffic is flat, ad spend is rising and profit is dropping, you know you should be putting some of that into optimization. [/pullquote] This may seem like a no-brainer, but there is a period of sweat and anxious hand-wringing. You see, conversion optimization takes time. There is a very real dip in performance. When you reduce spending on ads you reduce your traffic and your revenue. For a period of time, your revenue drops until your optimization efforts get traction. It might look something like the graph below. This assumes a modest 5% increase in revenue per visit (RPV) each month for one year, and that 8.9% of ad spend, or $8900, is invested in optimization each month. In this example, we began with a conversion rate of 1.7%. If you can make it through a short valley of death, borrowing from your ad spend can be very profitable. Monthly revenue dips due to the reduction in PPC traffic. Revenue returns to baseline levels in month four. Revenue is positive in month six compared to investing in PPC only. The Return on CRO (green line) turns sharply north, even though we are still investing 8.9% of ad spend each month. This is what powers conversion optimization. You have a compounding effect working in your favor, but you have to invest on the front end. Send me an email if you want to see all my assumptions. It’s this four-to-six month dip that marketers and managers fear. How do you sell a drop in revenue to your boss? The other option is to reach into your own profits and slap down some cash on your conversion optimization team. I’m not going to sugar coat this. There are three costs you must deal with when investing in optimization. The competition in the marketplace is pretty brutal. Each year, we get more functionality from cheaper and cheaper tools. At a minimum, you’ll want a good click-tracking tool, a good session recording tool, a strong analytics database and a split-testing tool. Depending on your traffic, these can be had for a few hundred dollars each month up to several thousand dollars each month. A researcher to collect qualitative data. A statistically-responsible person to collect and evaluate quantitative data. A developer to create the changes in each test. A designer to implement design changes. A patient QA person to be sure nothing is broken by a test. A project manager to keep the momentum going. It is possible to have one super-amazing person who can do all of this. It is the death-knell of your conversion optimization program to ask someone to do all of this in addition to another job. Your PPC person is not going to be able to do all of this and their job too. These are fairly expensive employees. Consider hiring an outside agency, like us, to get started. As of this writing, Conversion Sciences can provide these functions for less than ten-thousand dollars a month. There is a cost to testing that is not seen in reports. It’s the cost of losing treatments. In any list of “good” ideas for increasing your conversion rate and revenue per visit, fully half will actually do more harm than good. We don’t know which of our ideas are “losers” until we test them. When we test, some percentage of your visitors will see these losers, be turned off, and won’t buy. This is lost revenue. With proper management, this downside can be minimized, but it is the cost of doing business. It’s the price of admission, the overhead, the burn, that funny smell in the kitchen. It’s hard to budget for this particular line item, but it should be part of your discussion. If I haven’t scared you off, there is good news. We call it the upside, the green bling, statistical bignificance, and sometimes we just dance. You should understand what your statistical bignificance is. You must know the answer to the question, “What happens if my conversion rate goes up a little?” We call this a Basic Unit of Upside. Click for a Conversion Optimization Upside Report that does the math for you. We offer our Conversion Optimization Upside Report to help you understand your upside. It calculates what your yearly increase in revenue would be if you only added 0.1 to your conversion rate or revenue per visit. Plug in a few numbers and you’ll see what small changes mean for your bottom line. For most businesses, conversion optimization is a ten-thousand-dollar a month investment or more. Many businesses are spending a whole lot more than that. If conversion optimization is on your “maybe next year” list, consider what might happen if you give your competitors a year’s head start on you. The business with the highest conversion rate has the lowest acquisition cost and can profitably boost bids on their paid advertising. Plus, Google favors high-converting landing pages when assigning ad placement. With a realistic understanding of the costs of conversion optimization and a real appreciation for the potential upside, you should be able to make the case for adding it to your shopping list in 2016. Feature image by frankieleon via Compfight cc and adpated for this post. If you are anything like me, you’ve made your fair share impulsive purchases online. Unlike trekking into brick-and-mortar, I never get on the Internet with the intent of pulling out my credit card. Yet, inevitably, I’ve got two food delivery subscriptions and a blouse from the JCrew factory store shipping out tomorrow. Are your visitors like me? How much of your business comes from impulsive behavior? Most importantly, are you converting your impulse visitors before their craving to buy passes? In this post, I will show you how to quantify the number of impulse buyers on your site using Google Analytics, and I will also share strategies on how to get them to convert. We define an impulsive buyer as someone who is poised to take action. These are our spontaneous buyers, more likely to be relational than transactional. They may not be impulsive in life, but are behaving in their spontaneous mode on your site right now. What makes an impulsive buyer impulsive? They perceive the risk of taking action as low. They perceive the value of taking action as high. They perceive the cost of shopping as high. FOMO: Fear of missing out may drive their behavior. Familiarity with your products makes a purchase decision easy. Repeat buyers simply restocking will act as if they are impulsive. For these visitors, leaving a browsing session without having pulled the financial trigger is like leaving the confessional before they’ve received their prescription of penitential prayers. It’s a complete waste of time and fundamentally misses the point of the exercise. For these buyers, you should dedicate a portion of your site to mitigating risk, building value, pointing the way to purchase, creating scarcity, and spelling out the facts. [pullquote]Impulse buyers aren’t the crazed shoppers that can be found assaulting each other in the Walmart on Black Friday. [/pullquote] These buyers may be thoughtful and methodical in their approach. However, they will buy from someone today, unless no alternatives present themselves. If they don’t buy from you now, they will most likely not return. Impulse buyers don’t announce themselves upon arrival at your website, but they leave footprints in your digital sand. To start, we’re looking for those one-hit wonders, the drive-by shoppers. Google Analytics tracks this behavior for us with the “Time to Purchase” report. Impluse buyers are, by definition, those visitors who purchase within their first visit. Thus, we want to know which transactions are completed on our site within a single session. For an ecommerce website, a single-session percentage of more than 80% indicates that quick buying behavior is contributing to your overall conversion rate. You’re probably serving your impulse buyers well. If single-session conversions make up less than 60% of your total transactions, one of two things is happening. You are selling something that methodical customers are going to purchase, such as appliances or a college education. You are not satisfying the impulse-buyers’ craving before it passes. Google Analytics makes it easy to track impulse buyers on your site. Create an advanced segment for those visitors who purchase in one session. When you look at your Google Analytics reports through the lens of this segment you will see how impulse buyers are impacting your business. Impulse Buyers (blue line) are a significant portion of all revenue (orange line) for this ecommerce business. Use this segment to answer other questions as well. In the graph below, it is clear how an email promotion to existing buyers affects the impulse buyer segment. Email campaigns appeal to return and repeat buyers (orange line) and less so to first-time impulse buyers (blue line). How did these visitors get to your site? Where did they land? 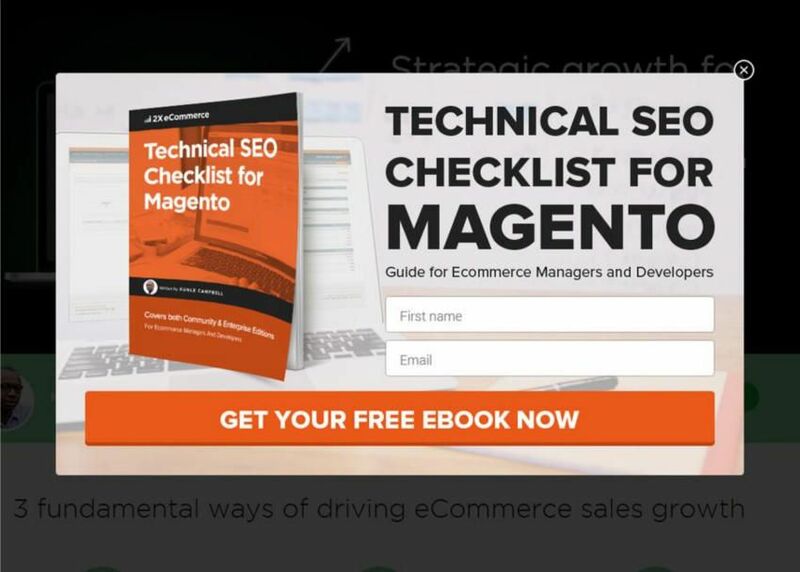 Did they use site search or navigation to get to a product page? What items did these quick buyers purchase? Sessions with Searches: Search is clearly not important to most impulse buyers for this site. Answering these questions will help to develop a map of impulse behavior on your site. With this blueprint, you’ll be able to pinpoint the areas of your site that attract impulse buyers and begin to test conversion optimization efforts that focus on them. When customers are poised to buy, they do a risk assessment. Impulse buyers love low-risk transactions. This is the job of what we call risk reversal tactics. A risk reversal tactic is anything that takes the risk out of a transaction. Risk reversal comes in many forms. Often sites signal that they can’t be trusted without even realizing it. They hide their return policies, or make them so complex that they become meaningless. 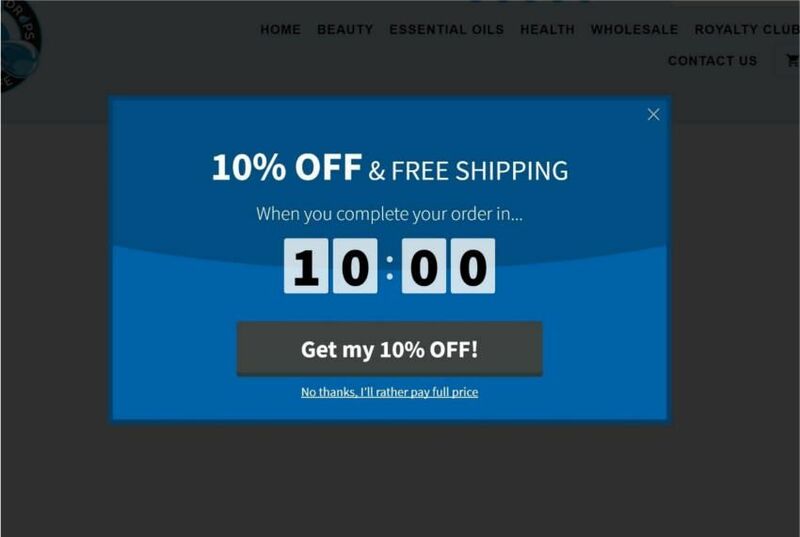 They don’t display free shipping offers in a prominent place. Impulse buyers have a quiet voice in their head asking “Is this a good idea?”. What can you do to make sure the answer to that question is always “Yes”? The vaguest, most theoretical thing you should be doing is making people feel good about giving you their personal information. Trust symbols must be obvious but subtle enough to avoid that “Trust me! Trust me! Trust me!” vibe that we get from used car salesmen, so incorporate them as naturally as possible. Take Jetpens.com, an online store selling Japanese pens and stationery. JetPens naturally decreases risk reversal with the trust symbols on their checkout screen. This store is somewhat specialized, so it doesn’t have the same degree of trusted name recognition as an office supplies store like Staples or Office Depot. One way it resolves the issue is having the Google Trusted Store symbol in the lower right corner. It sticks to every page, not just the checkout screen. This is called “borrowing trust.” Sites can borrow trust from current clients, credit card companies, and certification organizations like Google and Buyer Safe. While you may see free shipping as a pricing issue, it really acts to reduce risk. It reduces anxiety about spending money on a website. It is can also increase the average order of impulse buyers. JetPens offers free shipping for orders over $25, and they make it really easy for you to hit that mark. You know exactly how much you need to spend to get free shipping. There’s no need for their impulse buyers to do any math. In lieu of free shipping, it pays for your site to be up-front about what shipping will cost. This takes the surprise out of the transaction, reducing cart abandonment. JetPens uses a Calculate Shipping button for just this purpose. You don’t even have to leave the checkout page to fill your cart to hit the $25 mark. Getting to the $25 mark that signals free shipping is pretty good motivation for most people to spend more money, but once someone is in the checkout screen, do you really want them to leave it? By placing a few items from account holders’ wish list at the bottom of the page, JetPens makes it easy for impulse buyers to double-down. Customers see how much more they need to spend and a great suggestion for how to get there. If the visitor hasn’t added anything to their wish list, why not add a few inexpensive suggestions of your own? With online retail, shipping information needs to be easy to find. Free shipping isn’t the only reason people convert: they’ll also be more likely to buy if they think it will be easy to return what they bought. Someone doing lots of research on a product may be willing to hunt around for money-back guarantees, but impulse buyers need trust symbols to be much more in-their-face. ModCloth, an online women’s clothing store, uses the top of its website to embed lots of different trust symbols. The top of ModCloth’s website covers lots of trust-building bases. Customer care and shipping information is at the top of every page, and when you visit the page on returns and exchanges, it’s also pretty easy to understand. Someone in a hurry to spend money may not make it all the way to this page, but she’ll know it’s there, and she’ll know that exchanges are free without even clicking. Why wouldn’t she spend her money if it’s that easy to get rid of something that didn’t work out? Scarcity is a term that includes limitied supplies, limited-time engagements, exclusivity and qualifications to buy. It imparts a sense of urgency to a shopping session, and impulse buyers are just looking for excuses to act. Give your impulse buyers excuses to act by making it clear that she will be missing out if she doesn’t buy right now. Remember, impulse buyers see the shopping process as expensive and don’t want to waste their time. Dwindling stock makes this item much more attractive. Only one Window Shopping Chic Dress left?! What am I going to wear when I go window shopping this weekend if that dress doesn’t end up in my closet! Many impulse buyers like feeling like they’re part of an exclusive group. It feeds their egos and justifies the elitist tone they use when they brag about how the rest of us weren’t able to wear the right window shopping dress. Free gifts and bonuses add value to a perceived purchase. The gift doesn’t have to be an extraordinary offer. It provides another excuse to act, often increasing urgency. SheIn hits that impulse buying nail on the head not once, but twice. First, a popover tells you that there’s an opportunity for a free gift. But here’s the fun part. 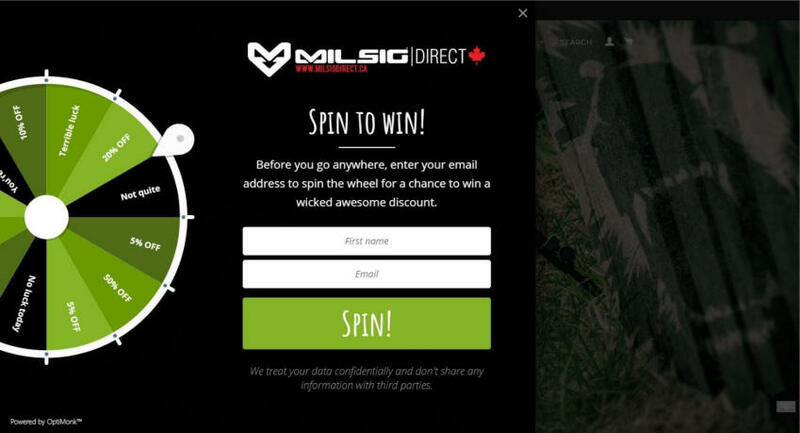 You have to start a wheel for a free gift. So it’s a game! Shoppers play a game to get a free gift. This strategy works for pretty much any kind of business, not just retail. SheIn asks you to join a mailing list order to have the chance at spinning the wheel to get a free gift, so it’s a lead-generating strategy. One result is from the American Orthopaedic Foot and Ankle Society. The name alone seems pretty trustworthy. What do they have to say about what shoes I should buy? Yikes. This isn’t even half of the article! Luckily, I have another option to help me find the answer to my question. Runner’s World magazine makes things so much easier! First I take a short quiz, then it spits out a shoe suggestion for me. Runner’s World doesn’t want to sell me a shoe, but if I were on a retail site selling running shoes, how awesome would it be to be able to click “Add to Cart” from this page? This weekend I had a movie night with some friends at my house because we urgently needed to watch the first Magic Mike movie. We didn’t want to miss any major plot points when we watched the soon-to-be-released sequel. I rented the movie on my phone using the Google Play Movies & TV app. I tapped the purchase button, and openly lamented to my friends how easy it was to throw my money away. I mean disgustingly easy. Three taps and four bucks of my hard-earned money was gone, replaced by the privilege of having two days of access to a movie I hope my mom never finds out I watched. Voila, I made a purchase I kind-of-but-not-really regret. Your website could have that purchase! [pullquote]On mobile, fewer people are doing research. They’re either buying, or they’re leaving. [/pullquote] I wanted that Magic Mike movie, and I wanted it right then. More obstacles would have meant using a different app or just watching a different movie I already own. Buying something from you should be as easy as renting a movie on my phone. Park the things you know about your desktop users. Think about the needs of your mobile visitors as if they were a different animal. They’re not unicorns or dragons or anything, but you wouldn’t put a leash on a cat. They just won’t stand for it. As an example, Victoria’s Secret realized that promo codes are to mobile users what pull cords are to blow dryers. They’re not the right tool for the job. 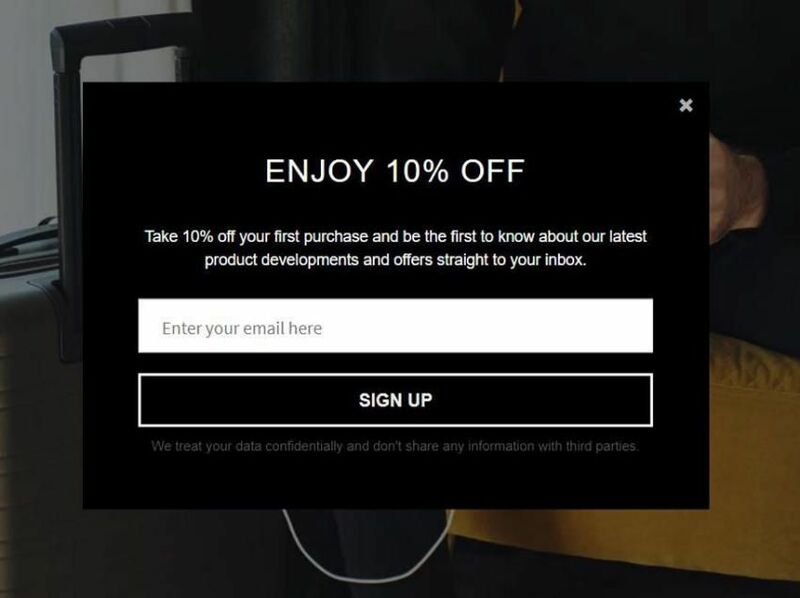 Victoria’s Secret doesn’t ask mobile visitors to enter a promo code. Impulse buyers become impulse abandoners when your site doesn’t serve their need to take action. The moment they perceive that a transaction is low value, that the effort is too high, that a purchase is risky or that there is no urgency to take action, they become less impulsive. It is not manipulative to feed their need for speed. Giving impulse buyers the rationale to act is exactly what they want from you. Why deny them? Feature image licensed under Creative Commons and adapted for this post. We test just about everything we can here at Conversion Sciences. We are always surprised by what new technologies teach us about people, even if the technologies aren’t widely available. We’ve been fortunate to participate in a trial of the new oPhone, a device manufactured by Vapor Communications. The oPhone transmits scent across the Web, right to the desks of shoppers and to their olfactory receptors. Vapor has put the device into a large group of beta testers who keep it attached to their computers while they go about their daily tasks. We designed a test to understand which scents drove more sales of which products on a client site that sold a variety of products. Would a leather scent sell more shoes? Would a male cologne make women buy more? We designed a system that would send one of ten different scents to any individual oPhone beta users that visited a client website. They were never told when they were visiting an oPhone enabled site. The scents we tested were leather, lavender, bubble gum, Old Spice cologne, new car, pine, Febreze®, Chanel No. 5, mint, and no-scent. Each of these scents required that we have a separate oPhone attached wirelessly to a one of ten computers. These were then routed through our testing software for delivery to the oPhones attached to the beta testers’ computers. Odor is of particular interest to us because of the way the brain processes odors. It is the only one of the five senses that bypasses the thalamus, the traffic-cop of the brain. Smells, it seems, have free and direct access to the limbic system – the “lizard brain” – and the neo-cortex, where memories and experiences are stored. This, it is believed, is why smells are able to transport us to places we’ve been before, affecting our moods, emotions, and appetite. The oPhones device both “records” scents and “plays them back.” It will accept a scent in the form of a gas, spray or aerosol. The devices analyze the odor and transmit a signature to the host computer who then controls when that signature is sent (scent?) to the visitor’s computer via IP triangulation. If the visitor’s computer is connected to an oPhone, the odor is reproduced for them. As our tests reached statistical significance, the “Old Spice cologne” odor was winning for all products in all categories, far above the other eight scents and the control (no scent). “Why was mint so successful in driving sales?” we wondered. So we played the scent back on our oPhone. The subtle, yet nostril-inflaming aroma was quickly identified as belonging to the methane family of gases. Methane is rare in urban society, outside of the water closet. It seems that keeping track of ten oPhones and ten computers and ten test treatments proved too much for the person setting up these tests. An investigation revealed that one of the team members dropped an oPhone into their lab coat pocket in a rush to get off to the bathroom. During their extended visit to the loo, our test assistant was back in the lab capturing scent samples from each of the oPhones. She didn’t notice that one was missing. As far as we can tell, she captured a smell signature from the oPhone sitting in the pocket of his bowl-clearing colleague. It was supposed to be the “Old Spice” odor. Of course, we were relieved to have discovered the error. We would have had trouble convincing people that this guy had the odoriferous secret to sales of almost any product. We were also able to recommend some dietary changes to our colleague. Something just wasn’t right there. Nonetheless, we were left with a puzzle. Why did a scent that no one would consider odorable win so handily in our tests. We believe that the issue at work here is “relief.” Whatever our oPhone-stealing colleague had eaten the night before, the central compound in the odor was methane. This is true for all of us. After years of daily visits to our porcelain sculpture gardens, our brains learned to associate methane with a feeling of relief; a lighter feeling; a feeling that our vertical leap is maybe a few centimeters higher. All of these feelings were accompanied by one distinct smell: methane. Methane means “things are good” to our limbic brains. We speculate that people are tense when they shop. Perhaps the olfactory signal that relief has arrived made them feel more comfortable buying online. It could be true. None of these conjectures can be verified without more testing. What scent do you think we should test next? Let us know in the comments before April Fools day is over.